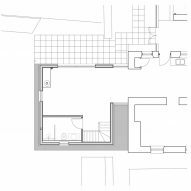 Built for a director of the practice who has lived in the cottage for 20 years, the extension provides much-needed additional space for a larger kitchen and dining area, as well as an additional bedroom and shower room on a mezzanine above. 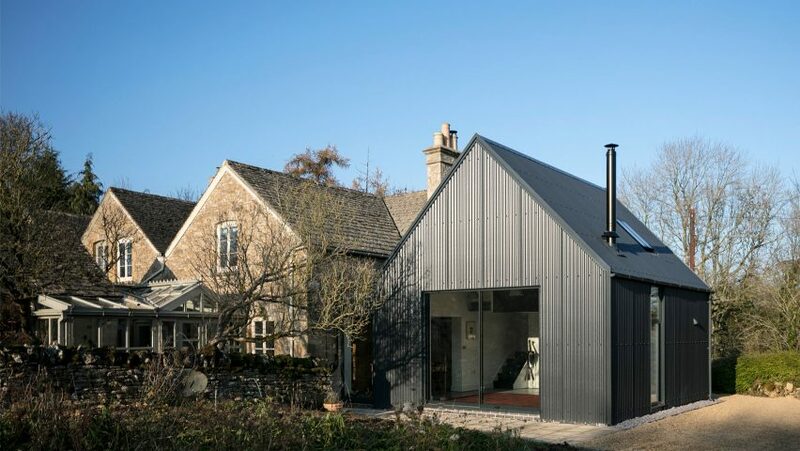 Clad entirely in corrugated metal panels, the extension was designed to reference the agricultural character typical of buildings in the area – in particular sheds. 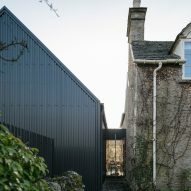 The extension matches the original cottage's orientation, but sits slightly back, deferring to the stone building. 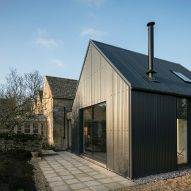 Its grey colour was also chosen as a means of minimising the visual impact of the building on the surrounding countryside. Large openings make the most of views out onto an adjacent paddock, purchased by the owners some years ago but difficult to see through the original cottage's small windows. 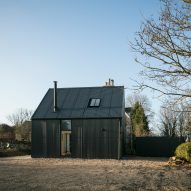 "The concept was to give the impression of a free-standing agricultural building," Andy Lucas, director at Eastabrook and owner of the cottage told Dezeen. 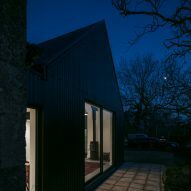 The corrugated material had the added benefit of helping the project achieve planning consent quickly without any changes. 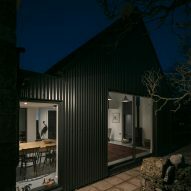 A simple, glazed flat roof link connects the new structure to the original cottage, providing views through to the garden at the rear of the house. 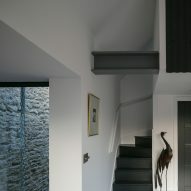 Internally, the extension is a simple double-height volume with a small mezzanine above. 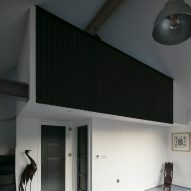 Finishes have been designed to again reflect an agricultural character, using epoxy floor paint, corrugated metal on the mezzanine balcony and industrial pendant light fittings. 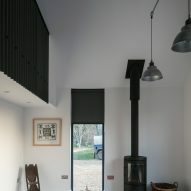 "The interior of the building was deliberately left minimal to reflect the simple appearance of a barn," said Lucas. 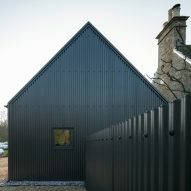 "We wanted to provide a contrast to the 19th century stone farm workers cottage." 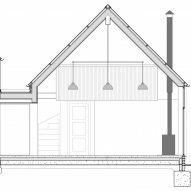 The structure uses timber structural insulated panels (SIPS), with a single steel beam used to support the mezzanine level, which has also been left exposed. 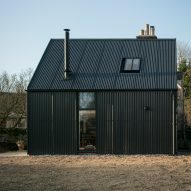 The corrugated cladding has a life span of at least 30 years without needing to be repainted, and can be recycled if the structure is dismantled in future. "The whole structure was erected in two days, resulting in substantial cost savings," said Lucas. "The building is also highly insulated, resulting in lower heating costs." 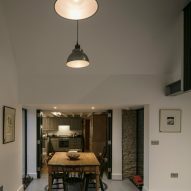 Eastabrook Architects has completed several contemporary extensions to historic buildings including an extension to a Grade II listed house completed with Jonathan Tuckey Design.